BRYAN, Tx. (August 8, 2018)- In an epic comeback win, the Acadiana Cane Cutters upset the Brazos Valley Bombers 3-2 in round one of the Texas Collegiate League playoffs. 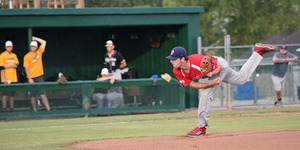 The Cane Cutters struck first in the second inning after Nathan Gabryszwski (Lamar University) drove in Kyle Bayles (Mississippi State) who reached base on a double. The Bombers tied the game in the fourth inning and later took the lead in the sixth. Alex Nelms (Southern Miss) started on the mound for the Cane Cutters and pitched six innings, striking out four batters. Bayles made the move to the hill from center field to get the win. He struck out seven of the 10 batters he faced and only allowed one hit. The Cutters threatened in the eighth, but were not able to drive in a run. With their season on the line, the Cutters came up big. Left fielder Cole Taylor (Texas A&M) singled with one out before Trey Harrington (SE Louisiana) hit a hard liner to left field. The ball got stuck under the fence and was ruled a ground rule double. This was a tough break for the Cutters as Taylor would have scored the tying run without this misfortune. Unfased, Mason Corbett (Texas A&M) came up to the plate and singled to score Taylor and Harrington to put the Cane Cutters ahead for good. The Bombers were threating in the ninth. With two outs the Bombers hit a hard liner, but Trey Harrington made a full extended grab from short to end the game. Harrington’s play cannot be underestimated as the Bombers may have scored the winning run had he not robbed them from a hit. With Harrington’s hit in the ninth, game winning run, and game saving catch, he was awarded player of the game for the Cane Cutters. The Cane Cutters now advance to the TCL Championship! The Cutters return to Fabacher Field tomorrow 8/9. Come out for the final home game against the Victoria Generals for Fan Appreciation Night! The deals are half price tickets, $1 beers, $1 hot dogs, 2 for 1 margaritas, and discounted merchandise. Gates open at 6PM! First pitch is at 7PM! Come cheer on the Cane Cutters as they have reached the TCL Championship for the 4th consecutive season. For more information and ticket needs call the Cane Cutters front office at (337) 451-6582 or go to canecuttersbaseball.com. For all news, stats, weather updates, and discounts for the 2018 season follow the Cane Cutters on Facebook at Acadiana Cane Cutters Baseball, Twitter @CaneCuttersBB, and Instagram at Acadiana_CaneCutters.